People have been laying comfortable materials on their floors for centuries. Animal skins, rugs, and carpets have made countless rooms more welcoming and comfortable. While they make things comfier, they also tend to pick up lots of dirt and stains. People have shaken, beaten, and vacuumed dirt and more out of their rugs and carpets, trying to keep them looking good. Modern carpet cleaning machines have given people an unprecedented advantage over dust, dirt, grease, and stains from their carpets, but they have to be used correctly. Professional carpet cleaning companies like ours make sure that cleaning happens the right way, and we work hard on both residential and commercial carpet. Carpet cleaning either involves dry chemicals or a good deal of moisture, and it can be damaging to your home if completed incorrectly. You would be amazed at how many people ruin their carpets by cleaning them themselves. However, self-cleaners aren’t the only culprits. Some carpet cleaning companies aren’t very good at what they do. Finding a carpet cleaning company who will carefully treat your property like it’s their own is key to making carpet cleaning actually work for you. 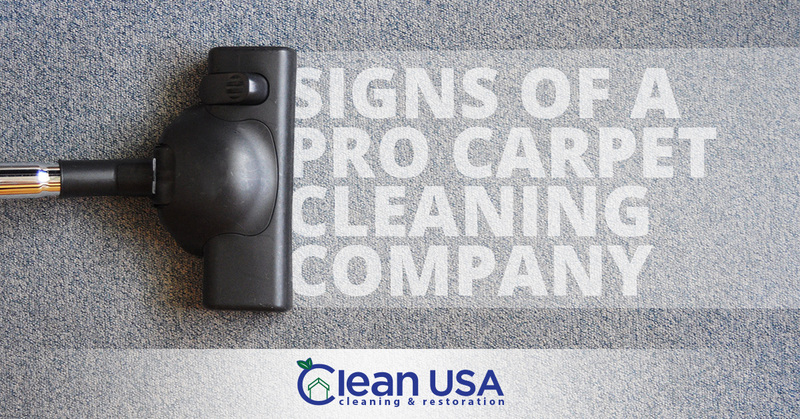 In today’s blog, we are going to explore five signs of a carpet cleaning company that will be able to give you the results you need. Any good service company makes it a priority to be available, accessible, and responsive. That means that whether you email or call, you should get fast responses. You shouldn’t find yourself leaving messages too often, and if you have to leave a message, you should hear back within 24 hours. This is especially true if you have an emergency; you should feel like you can access them easily. An experienced team will have run into lots of weird stains, carpet types, and conditions. You want specialists who won’t balk at the unique features of your home or business’s carpet. They’ll be able to make your carpet look better and last longer. However, no carpet cleaning company can make carpets look brand new, so if you encounter a company claiming they can do just that, you should find a different company. We live in the age of reviews, and you have many options when it comes to tracking them down. Reviews don’t just provide indicators of how the company works, they also illuminate how the company responds to input. Are they gracious? Do they ignore negative reviews or carefully address each one? The way a company responds to negative reviews reveals how they will respond to you if you have issues. They use the best equipment. Depending on the type of cleaning needing to be done, companies will use truck-mounted equipment or equipment they can carry inside a home or business. You want a company who invests in the best equipment their industry has to offer. You want a company dedicated to keeping up with new developments so that they can provide the very best service possible. Feel free to ask them about their equipment when you’re checking them out! You could say that all the above items are included in being professional, and you’d be right. However, professionalism also includes being courteous, careful, and willing to go the extra mile to satisfy your needs. They will all have uniforms, look neat and clean, and they will treat your property like it’s their own. At Clean USA, we’ve learned that homeowners and business owners do better when their carpets are clean. Clean carpets not only keep things looking good, they help people fight allergies and sickness. Turn to us for residential and commercial carpet cleaning today!